Copacabanna | Custom Bathrooms | Central Coast bathroom renovations – Modern bathroom ideas. Situated in Copacabana, this bathroom boasts beautiful ocean views. 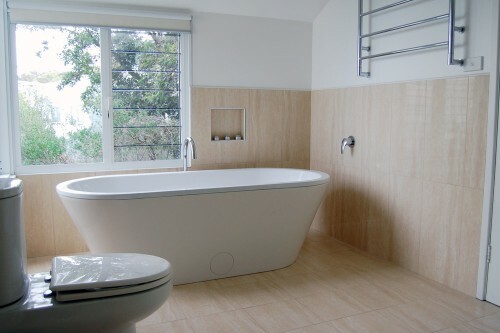 Custom Bathrooms designed this bathroom with this in mind and the timeless travertine tiles are incredibly stylish and complement the beachside location. With the freestanding bath situated beneath the window, our client can relax in their stunning new bathroom and enjoy the beautiful view.